Oxfam works with others to relieve poverty and suffering. There are 2 shops selling clothes, bric-brac, linen etc. 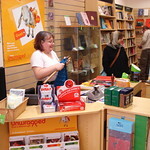 This branch specialises in books, and the Union St branch also sells many Fairtrade food and gift items. Instead of taking your unwanted household items and clothing to the tip, save on waste and take those in good condition to Oxfam, or other charity shops and help a good cause. Trade, Education, Debt and aid, Livelihoods, Health, HIV/AIDS, Gender equality, Conflict and natural disasters, Climate change, Democracy and human rights, and other related issues. 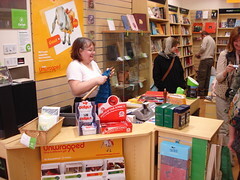 Volunteers are always welcome to work in a variety of roles within Oxfam, from helping out in the local shop, to overseas project work.